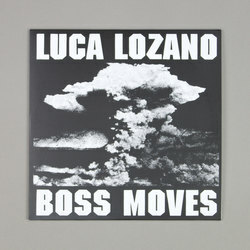 Luca Lozano - Boss Moves. Vinyl LP. Bleep. Anyone unfamiliar with Luca Lozano need only glance over his affiliated labels to know what they’re getting themselves in for. 100% Silk, Unknown To The Unknown, Super Rhythm Trax and more have all hosted tackle by the Klasse Recordings boss. Now he teams up with Running Back for the first time to drop the Boss Moves double-EP. Here Lozano channels the hybrid sound of mid-90s London, a scene where artists like The Future Sound of London and William Orbit cross-pollinated styles with carefree abandon. As such this record takes in breaks, acid house, jungle, Detroit techno and plenty more across its nine tracks. Mister Right Now + DJ Fett Burger Remix!